Disposing Martha | "In good writing, WORDS BECOME ONE with things." There was a time when women got married, bought a four-bedroom house, and expertly knew how to care for every aspect of their home. 2008, the year I got married, was not that time. And my mother knew this about me. She knew that not only did I not really have a clue about home maintainance, but that I was taking the easy road by living in a condo versus a house (thereby eliminating half the work — cleaning out gutters is not part of my spring cleaning routine). 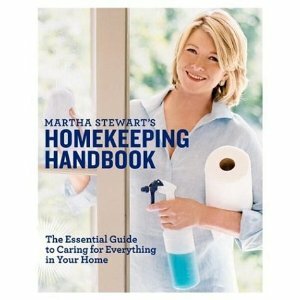 Yes, she bought me Martha Stewart’s Homekeeping Handbook, and I’ve never looked back. While most people would stuff this on a shelf and only dive for it in the wine-on-carpet disaster scenario, I have decided to read it cover-to-cover. I tend to retain information like this, so I figure if I just read the whole thing I won’t need to look everything up all of the time. Naturally I do this in a closet with a flashlight, because reading it is, of course, mortifying. What’s less embarrassing is when that book totally saves the day. Last week, Mike and I were talking about how we tend to make each other do chores based on gender. For instance, I always do the laundry and change the sheets, and he always takes out the garbage and fixes anything that breaks. But then the garbage disposal broke. And we got into a tiny argument about the fact that neither of us intrinsically knows how to fix a garbage disposal. I was extremely dismissive, you know, in that charming “Not my problem!” manner. He was slightly irritated that this was his job just because he’s wearing the pants. And then it hit me — MARTHA! I ran into the den and pulled Martha off her place on the bookshelf. I remembered reading a little how-to on fixing the garbage disposal. I raced through my index, found “Garbage Disposals” and flipped to page 89. “How to Fix a Jammed Garbage Disposal.” Eureka! Mike opened the cabinet below the sink and had all his tools at the ready. I started reading from Martha (everything was numbered and extremely detailed with things like “1. Turn off circuit breaker to stop power to disposal.” I honestly would not have thought of that). After shutting off the power, Martha told us all about removing blockage and using our “reset button” (disposals have buttons?). After jamming things around in the sink for a few minutes (no actual tools required), we turned the power back on and tested the disposal — voila! The genius of Martha lives on! Mike’s look of shock was barely disguised, and my victory dance wasn’t remotely concealed. We felt like we had broken through the genderism and had actually fixed something together…well, the three of us — Mike, Abby, and Martha. The woman knows her stuff. Or pays people to make her look good. Either way……….. I still give you the credit for giving me the book in the first place. Yea! Good for you guys! It’s all about teamwork. I’m going to go out and purchase a copy of that little treasure for myself. And they didn’t call me…..now I can start calling them to fix stuff in my house!!!! I know! It took all our strength not to call you. Yoo-hoo! Way to strive & thrive, you two!